Alloys Unlimited is a distributor of Specialty Tool steels, Alloy, and Carbon round bars. We house a large inventory of various grades, sizes, allowing us to rapidly supply you with the product you need, when you need it. We offer a rapid response system that will give you a price quote within minutes. In quantities from one to one million pieces, we can supply you with round bars with diameters from 5" to 28". Smaller diameters are available upon request, and if you have large diameter requirements, we are only one of a few suppliers in the U.S. with the resources to accommodate the larger sizes you need. Standard bar lengths of up to 20’ can be specified, and random lengths can also be supplied. Heat treating, using a variety of methodologies including normalizing, flame hardening, and annealing, is done per your requirements to meet the needs of the intended fabrication method and part specification. Ultrasonic testing is part of our quality assurance management system, which ensures that you are receiving only the highest quality materials. We are able to process orders with lead times as short as 24-hr and our fleet of delivery trucks provide shipments within 125 miles. For more information on our tool steel, alloy steel, and carbon steel bars, contact us today. 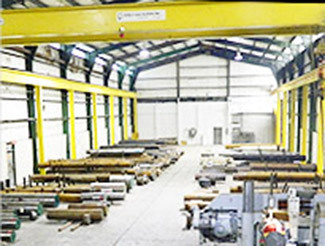 We here at Alloys Unlimited, are a thriving Specialty Alloy, Carbon and Tool Steel bar distribution center. Located just a mile North of Interstate I-80, our 88,000 square foot facility enables us to stock a variety of sizes and grades. We have 14 fully automatic band saws, including three with capabilities up to 28" round or 20" square. Whether it is 1 piece or 10,000 pieces, Alloys Unlimited can provide you with material, that is cut and shipped quickly, accurately, and on-time, every time! We can also offer semi-finished parts up to 28" round for dies, backers, bolster, liners, gears, sleeves, rings, hollow bar and tubing in any size or grade. We specialize in OD & ID combinations along with single or double-step down shafts, blind or stepped ID's, deep-hole drilling and trepanning among other rough machined options that we serve you with. 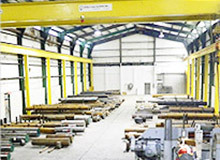 It is our 7 Turret lathes with capabilities of 28" round, along with 2 engine lathes and CNC Lathe capabilities that enable us to offer these services. Need special Heat-Treating? Not a problem! We can supply you with those hard to find Brinell or Rockwell Hardnesses along with Annealing, Normalizing, Stress Relieving and Flame Hardening so when material arrives at your door, it is ready for its finishing machining. The Alloys Unlimited quality management program ensures that all materials comply with ASTM, AISI, or SAE specifications and all products are fully certified. For more information about our products and services please contact us today! !